It sounds like you have a temperature blend door actuator that has gone out. Here is a guide to help walk you through the steps with diagrams below so you can see how to do the job on your truck. Here is a guide for a general heater not working problems. 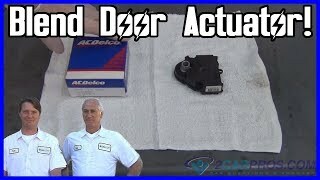 Here is a blend door actuator on your car (below) Also check the vacuum line from the engine to the firewall (small) to see if if its broken. Check for vacuum at the actuator line. Please let us know what happens. 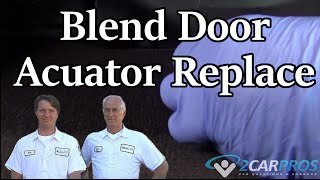 Can it be the blend door actuator? How do I test it? Blend door and the blend door actuator are located on the heater case (plenum). Start engine and bring to normal operating temperature. Turn blower motor switch to LO position. position. If air temperature does not change, go to next step. If air temperature changes, system is operating properly at this time. Turn ignition off. Remove fuse No. 5 (15-amp), located in Central Junction Box (CJB). Check fuse condition. If fuse is okay, go to step 4. If fuse is blown, replace fuse and recheck system operation. If fuse blows again, go to next step. between CJB and electronic blend door actuator. See WIRING DIAGRAMS. Turn ignition off. Disconnect electronic blend door actuator 8-pin harness connector C229. exists, repair open in Light Blue/Pink wire between CJB and electronic blend door actuator. Turn ignition off. Disconnect electronic blend door actuator control switch 63-pin harness connector C220. Measure resistance of specified circuits between electronic blend door actuator harness connector C229 and blend door actuator control switch harness connector. is 5 ohms or more on any wire, repair appropriate wire(s). Green wire) and No. 3 (Red/Light Green wire). See Fig. 7. Temperature control switch resistance should be more than 3000 ohms in full WARM position and less than 300 ohms in full COOL position. Resistance should change gradually as temperature control switch is turned from COOL to WARM and back. If switch resistance is as specified, go to next step. If temperature control switch resistance is not as specified, replace temperature control switch. Measure resistance of Black wire between ground and electronic blend door actuator harness connector C229 terminal No. 8. See Fig. 7. If resistance is less than 5 ohms, replace temperature blend door actuator. If resistance is more than 5 ohms, repair Black wire between ground and blend door actuator. Please let us know happens so it will help others. 1996 Ford F150 six cylinder two wheel drive automatic 200,000 miles. 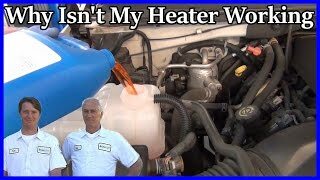 Just recently my truck's heater stopped blowing hot air and the same day it started having problems overheating. I have replaced the thermostat, radiator cap, and checked the heater core which is not clogged. I was wondering what could be causing these two things. Is it possible the heater core is broken if it is not clogged? If the truck started overheating at the same time, check the radiator for coolant circulation. With the engine cold, remove the radiator cap and allow the truck to warm up. See if you can see the coolant circulating once the thermostat opens. 1999 Ford F150 six cylinder two wheel drive manual 83,000 miles. Air conditioner works not heater. Also, cruise control went about same time. Could this be related? If you have not checked the thermostat do so test it or replace it. Here is a guide on how to replace it. 2000 Ford F-150 V8 two wheel drive automatic 160,000 miles. Okay, so my heat is not working. I am lucking that it is even warm after an hour of driving it. Last year the thermostat went out on it and I replaced that and now it is not working. The problem did not occur until last year. I really do not have the money to spend on parts that are not going to even fix the problem. So my question is what can I do to figure out what the problem is and how to fix it? Hi Jennp. Welcome to the forum. When you say it is not warm, do you mean the temperature gauge does not come up to normal or the air from the heater is not warm? If the gauge is low, pinch off the upper radiator hose for a minute or two while the engine is idling. If the gauge comes up to normal, suspect the new thermostat as the culprit. If the radiator hose is too hot to hold onto for very long, the thermostat is okay. Feel the heater hoses next. If they are cool but the radiator hose is hot, suspect a plugged heater core. They can be back-flushed with a garden hose. Also, check for a water control valve. They are only on vehicles with air conditioning, and are controlled with a vacuum hose. Watch to see if the lever on the valve moves when a helper switches between the various heater/AC settings. If the heater hoses are hot, suspect a problem with the door actuators on the heater box. On some models a pencil can fall down inside and block a door. Sometimes that causes the actuator to break. 2000 Ford F150 V8 two wheel drive manual 185,000 miles. I have no Heat A/C is okay, thermostat not stuck, heater coil not bypassed, vacuum in engine compartment okay, selector switch knobs not stripped, good cold air for summer no hot air for winter. Please help burr it is cold out. I need to know where to start and what to fix? Thank you poor man. Hi there smsmasterwelder and thank you for the donation this is what keeps the site going. Other possibilities: Air mix/blend/mode/recirculate door problems, vacuum and actuators and the HVAC control module. Blocked circulation through the heater core due to either sediment in the core or a defective heater control valve. Feel the heater inlet and outlet hoses while the engine is idling and warm, and the heater temperature control is on hot. The hose will not feel hot on the heater side of the valve if the valve is shut. The outlet hose will also not be hot. With cable-operated control valves, check the cable for sticking, slipping (loose mounting bracket) or misadjustment. With valves that are vacuum operated, there should be no vacuum to the valve when the heater is on (except for those that are normally closed and need vacuum to open). Someone may have misrouted a vacuum hose. With electronic heater control valves, check for voltage at the valve. It should have voltage when the temperature controls are set for maximum heat. If the solenoid fails to move when voltage is applied, it is defective and needs to be replaced. If the heater core appears to be plugged, the inlet hose may feel hot up to the core but the outlet hose will remain cool. Reverse-flushing the core (forcing water into the heater outlet pipe with a garden hose) can sometimes open up a blockage, but usually the core will have to be removed for cleaning or replacement. Air pockets in the heater core also can interfere with proper coolant circulation. It is akin to losing the prime with a siphon pump. Air pockets form when the coolant level is low or when the cooling system is not properly filled after draining. Low coolant level usually the result of overheating or a coolant leak. A low coolant level can starve the heater resulting in little or no heat output. To check the level, pay no attention to the overflow reservoir. Shut the engine off, wait twenty minutes or so for the engine to cool, then carefully open the radiator cap. Allow any residual pressure to vent itself completely before removing the cap. If the coolant level inside the radiator is low, adding coolant will not fix the problem if there is a leak. Inspect the water pump, hose connections, radiator and engine for coolant leaks. Also, pressure-test the cooling system and radiator cap to check for internal coolant leaks due to a bad head gasket or cracks in the cylinder head. Check the pressure rating on the cap to see that it is correct for the application, and carefully inspect the cap's gasket and spring. Replace the cap if it cannot hold its rated pressure or has the wrong pressure rating for the application. Cooling system neglect can allow internal corrosion to eat small holes in the heater core or where the pipes are soldered to the end tank. Leaks also can be caused by sediment circulating in the cooling system. Sediment is abrasive and will literally wear holes in the heater core. A leaky core will often drip coolant into the passenger compartment (do not confuse this with water condensation that may be coming from the A/C evaporator). Leaks also can develop from fatigue cracks in the inlet and outlet pipes. This is caused by flexing of the heater hoses from engine torque and/or vibration. Adding sealer to the cooling system may provide a temporary fix, but the long-term cure is to replace the heater core. Defective or missing thermostat that allows the engine to run too cool. Maintaining the correct engine operating temperature (usually 200 to 220 degrees F.) Is essential not only for good heater output but also for good fuel mileage and proper operation of various emissions control functions. If the temperature gauge on the dash reads low, the engine is slow to warm up or you can feel coolant rushing through the upper radiator hose when the engine is cold started, the thermostat is stuck open (or missing) and needs to be replaced. Be sure to install a thermostat that is rated at the same temperature as the original (usually 195 degrees on late-model cars). A weak water pump that fails to circulate an adequate amount of coolant to the heater. This problem also will cause the engine to overheat. If the problem isn't due to a slipping drive belt, the pump probably has an eroded or separated impeller. i just had the heater coil replaced, and new thermostat, but no hot air comes out, when I had the heater coil replaced last year it was hot, but this year it is not hot. Check the thermostat and heater core if it is clogged and air blend door if its stuck. Start here. 2000 Ford F150 V8 four wheel drive automatic 250,000 miles. I live in Alaska. This morning on the way in to work my heater started blowing cold air and would not get warm. What is causing this? For a start replace the thermostat and go from there. 2000 Ford F150 six cylinder two wheel drive manual 227,000 miles. Why no heat? All fluids are full, but were very low before refilling. Check intake manifold for leaks. Check and replace thermostat. Where do I find heater control valve on a 2000 Ford F150? Does not have uses actuated blend door to select heat or cool. 2000 Ford F150 six cylinder two wheel drive manual. My heater is blowing cold air and yesterday the the temperature gauge went up to high.